Hello all. I bought this Koummiya recently and just got it. It is out of my area of collection, but it was and opportunity. It is a fairly standard piece, I think, 42cm (16.5") with some condition issues, like pitting on the blade and some details of the silver decoration are worn. The blade is thinner than I expected, only about 2mm max, hollow forged, sharp and seems of reasonable quality. It is authentic because you can see it has been carried and used. My question is about the age. Is this a 20th or 19th c. piece? Is it possible to tell at all? See http://www.vikingsword.com/ethsword/koummya/index.html for an excellent report on these Moroccan weapons. and http://nimcha.fr/koummya.htm where all the different forms are illustrated. Salaams motan ~ I realise that you may have read these as you appear on one of those threads but there are loads of members who will not have seen those... so it is my way of making the references visible to all ...I was top scorer at school in cricket... 6 runs !! I wouldn't be bothered if response is slow and with your obvious enthusiasm for Moroccan Koumiya it will attract more... The pictures are top quality and it can be seen that this is a good example and your note that the silver is slightly worn...oh and the zig zag surface decoration I have seen on other similar weapons at Library..I would only guess at the age based on this wear and suggest a mid 20thC as probable. I would be happy (like in cricket) to accept a half century !! I was hoping it was older, about a century old, but you may well be right. At least it is not a tourist piece and I will probably sell it after I have enjoyed it and buy something closer to home, like perhaps a Hejazi shybriya for the money. As for the pictures, the secret is good light. I ususally take pictures at night and if you don't have studio lighting, it is very difficult. However, in my country, like in yours, the sun is blinding and there is plenty of indirect light in the shade during the day. I have seen many of these koummiya / koummya / Khoumiya type jambiya and for the most part they have just not caught my interest, they seem to be more of a form of cultural identification and that the related genoui / janwi dagger was more of a serious fighting weapon. Your example is quite nice and looks at least not to be brand as many I have seen lately are. I personally do not consider signs of use and age to be "condition issues", this is expected and something I always look for. As for age, I rarely see one that appears to be really old, I have trouble trying to set some kind of age, hopefully someone here has some more knowledge of these types. Nice photographs by the way! Last edited by estcrh : 27th June 2017 at 10:35 AM. I confirm mid to end of 19th c.
Nothing to do with the 20th c. koummiya. Any tips on what to look for as far as dating these go? You don't have such kind of koummiya in the 20th c.
The early 20th c. koummiya are also a bit different. The nut at the end of the scabbard appears on many 19th and 20th C items and blade style seems similar except say on Lions Tooth Style blades and the straight version more like the S'boula and as far as I know and having read at length all the references, I can find no style change across the last couple of centuries in hilt or scabbard since these daggers follow the same essential rule of having not changed ..that being the central trait in Islamic Arms and according to the late Anthony North whose lead in sentence at Islamic Arms and Armour illustrates the point...i.e. They, (ISLAMIC ARMS) didn't change. It is interesting that the key Forum treatise on these weapons does not lay down a format for determining age...and that if you have a valid system it would be an advantage to have it written up... I would very much be intrigued to know what it is. In this regard I echo the excellent question set by motan at #1 which was Quote "My question is about the age. Is this a 20th or 19th c. piece? Is it possible to tell at all?" Unquote. This sort of daggers is far away of my knowledge but when I look to the koummiya in question I also think that we see here a 19th to early 20th century piece. When you look to the loops where the rings for the carrying strap are attached you can see some serious wear which can't come from short or no time of use. And I agree with Kubur that the overall appearance is the one I am used to see by good old/antique examples I've seen here and the few ones I've handled. But like said, I am far away to be an expert for this daggers. These are way outside my field as well, though I have touched on them on occasion over many years. One key writer here, Louis Pierre Cavalliere wrote a wonderful paper on them it seems about 15 years ago, but I cannot find copy. One of the reasons for slow response, in my case, is going through as much material as I can find to answer as much as possible. In the mean time I always hope more informed people can add notes, which here they have. I think the latter 19th century pretty much right on this one (very nice BTW!). I think as Kubur has noted, the blade is one key point in recognizing older examples. This one is particularly notable having a blade with rib, which is quite unusual as it is of course heavier. I have understood that newer ones have quite thin blades, and often without the distinctive bevels on the half of the blade distally . The scabbard also: older ones have the key decoration on the outer side only. The fretwork typically seen here on the displayed or outer side often is in motif incorporating the 'five' (hand of Fatima) in crosses, which very much aligns with one of the primary significances of the design of these Maghrebi/Berber daggers, its defense against the evil eye. The shape of the blade represents the boar tusk, an animal known for its defensive aggression, as well as regarded to defend from the evil eye. The shape of the pommel is of course typically termed 'peacock tail', and while often characteristic of koummya, however there are examples without it. I recall once being told the form may have derived from the Italian cinquedea, however the crescent type pommels were known in Islamic hilts as early as 16th century, and in Middle East earlier. The ancestry of the koummya as far as I have found seems early 19th and perhaps slightly earlier but I have not ever seen 18th century examples. Most vintage examples seem around 1850s into 1920s, but it seems that these traditional daggers are still being made for authentic wear, despite of course the masses of them commercially produced for tourists. The newer examples have the scabbard decoration both sides if I understand correctly. The baldric holes are also a point of reference as has been noted, and wear in these signifies years of wear. Fresh, tight and unmarred holes of course note the obvious. Last edited by Jim McDougall : 27th June 2017 at 10:49 PM. I think that you refer to this kind of Italian dagger and you are right these kind of pommels exist in Luristan and other middle eastern bronze age swords. Thank you all for your responses, Ibrahiim, Kubur, estcrh sajen and Jim who really seems to be the scholar among us. Kubur, thanks for your comments and because you seems to know the most about koummyas, I will go with your opinion - late 19th c +/- few decades. I agree that the wear in the loops of rings are attest that the dagger has been carried for several years and it is a good sign of an authentic piece. It is hard with koummyas as hundreds thousands of tourist pieces were and are made starting quite early too (1920's??). Many are exact copies of original types and you can tell they are for "export" only by small details. Others are pure fantasy, with stones, bone and shapes not found in original types. To make things even more complicated, some are old, but primitive- what some people call "village type", so that even the quality of the blade is not always a good guide. Anyway, I bought it because it was an opportuntiy (cheap), but I like it and will keep it, at least for a while. It is nice to have a well-crafted piece for once. My main area of interest are original ethnographic daggers from the Levant, but the majority of those have a "home-made" quality about them and are not a feast for the eye (see picture: South Syrian Bedouin dagger). The fact that the Levant, except for Damascus, has been quite poor in the 18th and 19th century may be the reason for the lack of serious dagger-making traditions. Estcrh, I understand what you say. Koummyas are a bit too much bling for my taste too, but we know each other's views on the fighting value of daggers in general. I am in it first for the ethnographic value, and second for the esthetic value. Whenever I think of the fighting with (even large) daggers, I have to think about that famous scene in Indiana Jones.. These Moroccan daggers are not really my area of interest, but I have seen quite a few and bought and sold a number in the past. From the quality and appearance of the piece in the images, for what its worth, I would guess the age to be in the range 1880 - 1940. Salaams Kubur~ Stunning detail of the Italian dagger with a clear indication of style of pommel similar to the Policemans hat type Chapeau de Gendarme of Khoummya of Morocco. (see below.) It appears that the designation peacocks tail refers to the more full range of Khoummya pommels although I have no idea what the typography is with dates of style... I need to go to Morocco for a few years to find out..!! 1. The Dagger style Chapeau de Gendarme. 2. The actual hat from which the term was taken. 3. How the weapon was worn. Last edited by Ibrahiim al Balooshi : 28th June 2017 at 03:59 PM. Eytan, thank you for the kind compliment, but my entries only seem 'scholarly' because typically in so many cases, as here, it is material I have just researched in order to write. In doing so, as here, it is fascinating to see the weapon being examined in historical depth, and I impart the information in the discussion so that the 'true specialists' can offer their experienced insight. It seems we have pretty much a consensus here on the probable period or range in which this example will fall, primarily latter 19th c.
I like the 'village' term used in categorizing ethnographic weapons which are traditionally styled and made but for genuine wear by native individuals. This is often overlooked when items are viewed as either vintage souvenier or modern commercial, or 'tourist', a rather pejorative assessment for someone seeking identification of an item or a collector who realizes he has stepped on a trip wire. As we see here, these koummya are very traditional, and it seems they are essentially developed from the Arab khanjhar, which are of course an essential male accoutrement. What I noticed on these terms used on these daggers is that the Arab dagger of these Moroccan regions, though styled very similarly to the koummya, has a much thicker hilt, and the fretted silver pommel cap is in polygon shape....while the Berber or tribal style seems to be a smooth curved arc, also in fretted silver. As Kubur has well noted, the 'peacock' form is quite different, and to me looks like a 'Napoleon' hat (for lack of better comparison) and its form does extend far into antiquity in regions around Luristan. These were of course the 'eared' pommel forms which led to such feature in some other weapons. As he notes, the similarity to European influences such as the cinquedea is tempting, however not really supportable, despite other Maghrebi forms using terms from such influences, as the genouii dagger (cf. Genoa). Actually it seems these type koummya pommels are often noted as a 'variant'. With the 'red pen', I like this technique of highlighting salient points in an illustration of an example, but always yearn for more detail on the significance of the highlighted items or features. As Ibrahiim has observed, many traditional forms have changed little over often very long periods of time, and I truly wonder just how far back the koummya actually goes as a distinct indigenous form. Perhaps the 'peacock' pommel actually did come in earlier through various Islamic influences from the Middle East, and the now more familiar fretted silver pommel caps were integrated into the form. The distinct 'tail' or sharply curved scabbard tip of course many equally have derived from Arab influences of the khanjhar (with the 'thum' or cap), but that still would likely have been relatively recent. I have seen examples of koummya listed as 18th century, but I have yet to see such classification as other than highly optimistic and unsupported. I wish I could find Louis Pierre's dissertation on Maghrebi daggers! (top photo) one of the hilt styles termed 'khanjhar' note heavy grip and most notably, the beveled or polygon pommel cap, silver fretwork. (middle) typology from the Cavalliere dissertation. Last edited by Jim McDougall : 28th June 2017 at 04:26 PM. Ibrahiim, we crossed posts!!! Excellent presentation on the 'Napoleon' hat!! 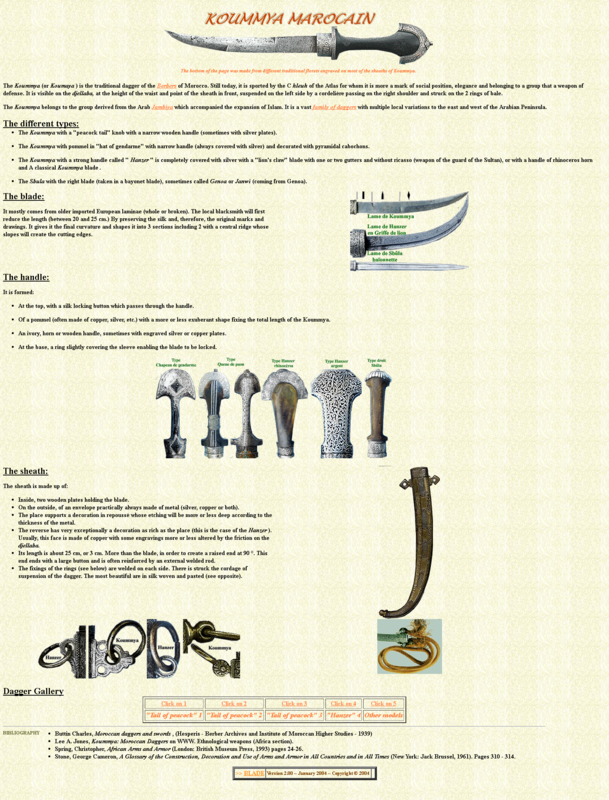 The little picture with a list of koummya hilt types and labels, could you post a larger version of that with better resolution piease? It is a great reference. I think the older koummyas are among the most elegant daggers in the Islamic world even if most often for dress. Some terrific examples shown here, including some older koummya blades. Nice thread to an underappreciated Islamic dagger form! Here is an example from The Met considered to be 18th/19thC. It certainly has some wear at the hilt and the holes are clearly worn. Last edited by Ibrahiim al Balooshi : 29th June 2017 at 07:18 PM. This Koummya is :20th Century Morocco - Ait Ouaouzghit region, Southwest Atlas. Very little wear is apparent though I agree it looks old.. Thanks Jim and Ibrahiim for posting some top quality examples. It seems that this thread is at its end and therefore, I thank everybody who paticipated and summarize what I have learned from and because of it. I think the last picture I posted is as you note Queue de Paon with the typical peacock tail pommel but not quite the Gendarmes Chapeau...Nice to hear you are keeping your Khoummya ! Hi Ibrahiim, of course you are right. Sometimes people write posts to threads that have been dormant for months. The reason I brought in the Chapeau de Gendarme in connection to the dagger you posted is that the pyramid-like studs on the scabbard are originally an element from that type. You probably noticed that I posted a picture of a dagger with brass hilt and leather spacers in this thread, very similar to the one you have and we dicussed it before. I bought one now and I am happy with it. Yes The Dagger You Posted is like the one I have,Am happy you found a good example for your collection as you have the best knowledge about the shibriya daggers from the Golan heights and other small villages .